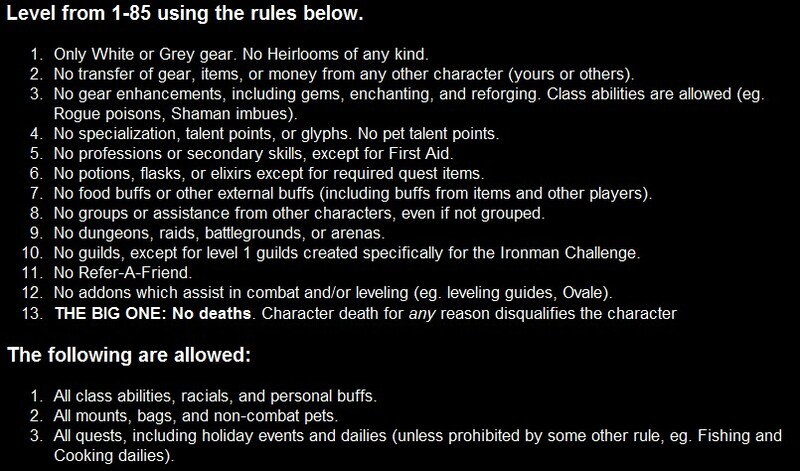 After having the gauntlet of WoW Ironman thrown down by Branchy, a druid from Saturday Knight Fever and reading the rules (see above), I decided to accept the challenge. The idea of leveling up doing it wrong appealed because with modern talents, heirlooms and reduced XP requirements leveling now is a face-roll and following the “rules” will actually make leveling a challenge, a very BIG challenge! My initial thought was to roll a warlock, but after realising at high levels the mana pool would be low and hard hitting mobs would really make it tough to do. This ruled out all mana classes with the possible exception of a druid. I ruled out warriors and rogues because of survivability issues and as death knights would need to do the starting zone naked (and aren’t really “in the spirit” of the challenge) I was left with druids and hunters. I decided (as have most people doing the challenge) to roll a hunter, Ironian (on Moonglade EU) because druids are a fragile jack of all trades and master of none without gear and talents despite their ability to heal and stealth. I rolled a dwarf for the instant tanky bear pet and the starting zone went really well and with some additional grinding of mobs I left Coldridge Valley at level 7. Dun Morogh questing went well which was to be expected as the zones are designed to be done in the quest rewards and the greens you get really don’t make you over-powered. After completing the Dun Morogh quests and hitting level 12 with some more grinding I moved on to Loch Modan and the experience reminded me a lot of leveling Evlyxx back in Vanilla because I was actually having to think about pulls plan escape routes. Things were going well until I picked up the Axis of Awful quest to go bad on me, but reading the WoWHead comments it seems I am not alone! The crime scene, most definitely not a victimless one…..
Oh well seems Ironian mkII will be the next “Great White Hope“. So far Kul Tiras EU is bringing me better luck and I have managed to get to the dizzy heights of level 21. But there has been a few heart stopping close calls like the quest to remove the rock in Redridge Mountains and being unable to tame the elite ettin 2 levels above me and having to kill it instead escaping with 7 HP and a dead pet (my piggy AppleSauce) and the quest Breaking Out is Hard to do which I was praying wouldn’t bug out on me. Any quest involving any kind of Murloc interaction, will most likely end in death and destruction. Hey Ash good to see you get in on the action & on a hunter too, who would have guessed. pfft munters 😛 when you reach quests such as those it might be an idea to pick up a different area to level in and do the "easier" ones of that area. theres nothing in the rules stating you must complete all the quests in the area before moving on. Hey El it isn't all about NOY doing the hard stuff but minimising the risk of buggy death as happened first time round while having personal pride in getting the zone quest achieve to show it's not all done easy mode. Else I could just mob grind to 85, imagine the dullness of that method…..